Happy New Year, and welcome to the beginning of your 10th year. I love having you on my kitchen counter, with all the notes I’ve written for each day through the past nine years. I love having you so much that I already have a second ten year garden journal tucked away on a bookshelf, waiting for the start of next year. Today, dear journal, I set up six hyacinth vases with bulbs of various colors. I bought the bulbs in October and kept them in the back of the refrigerator in a paper bag until this morning. Then later in the afternoon, I potted up a few paperwhite bulbs, a Christmas present from a friend. It was sunny but very cold today, so I left the outdoor lights up. Make this the year that you keep a journal of your garden, if you don’t already do so. All excuses for not doing it are just that… excuses. Are you waiting for the first of the new year to start a garden journal? Hey, that’s today! You can start today. Are you waiting for the perfect journal to write in? You can start with any notebook you have lying around, even that spiral bound notebook sitting in the bottom of that lower desk drawer, the one left over from your school days. Then later, if you find something better to use, you can transfer your first few entries to it. Are you afraid you will make a mistake and the journal won’t be perfect? I suggest you make a mistake today, on your very first entry, and then you don’t have to worry about that first mistake. It will be over and done with. Are you concerned that you won’t have anything to write? I have good news to share on that, too. Write anything. Even just the high and low temperatures for the day and whether it was sunny or cloudy or partly cloudy or partly sunny would be a good start. Are you afraid someone will see it? Unless you are writing your deepest, darkest secrets, who cares if someone sees it? No more excuses, embrace garden journals. Write a journal entry today and then another one tomorrow and then another one the day after tomorrow. Then before you know it, you will be the one looking back over nine years of garden journal entries! I also encourage journaling your garden. I can't count the times I have looked back to see if I had bought a particular plant, and then where I planted it! As well as variety names, prices I paid, weather facts, and on and on. It is a very valuable tool, fun to read back on previous years, and think of the "progress" your garden-and you-have made. I enjoy your blog very much, have a great gardening year! And Lee Valley has free shipping until Jan 3! Buy a nice garden journal today with your gift money! Carol, I especially like your advice to make a journaling mistake on the first entry....getting it out of the way. I had good intentions with my beautiful Lee Valley journal last year. . . I need to take it off the shelf and put it on my desk where I'll see it every day. I did write in it sporadically through last year - it's a start. This year I'll do better. Happy New Year to you Carol. Long live the journal. Between 'regular' blog posts, and dated digital photos, I no longer keep a paper journal. Digital is wonderful. You can search! As God as my witness, I was just thinking that I should start a garden journal....would you call this confirmation? Thanks! My 10-year garden journal is a good touchstone. I don't write every day, nor even every year! But it's a great way to benchmark the purchases, the life and death of plants, and the seasons. Since blogging, I've fallen a bit behind with the journal, but I think it's time to revive the practice. Long Live Lee Valley! I love my garden journal! I got the Lee Valley one after reading about it here and now I get their catalogs too - you corrupted me! Anyway, I love the journal and the 10 yr format. Although I am not particularly religious about making entries, it is fun to look back and see what we have accomplished over the years. It makes a great housewarming present too, in case you're looking for that perfect present for a new home owner. I'm convinced there is no substitute for the written journal. Yes, the same information can be kept digitally, but there's something about holding a book filled with you own handwriting about your garden activities, even if not every day has something noted down. I'm starting the halfway point on Vol. II of the Squirrelhaven 10 year journal. I have a fancy book I used the first year, but having 10 years at a glance is much more useful. 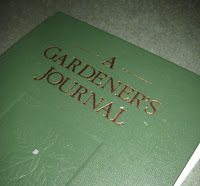 I have been keeping a gardening journal since 1986 I must admit that at first the entries were sporadic but now there is an entry almost daily I just use an old note book but have given gift of garden journal to my daughter who gardens as much as I do. Here here on journaling! How else do you remember what worked from season to season? Nothing chases the winter blues away quicker than reading how many pounds of tomatoes I was pulling up in August! Dear Gardener Carol, You know how I love journals. I keep two, yes 2, garden journals. I can't help myself. I am too wordy for the 10 year so the overflow goes into a different style of journal. I do like the way that 10 year journal keeps the gist of the year at hand and easy to compare to other years. Cheers and happy journaling. Carol I so agree. I started using a Garden journal around 2003 when I had forgotten where I last planted something or the name of the plants I planted. I first started out with just pen and line paper then saved the notes and added them to notepads and journals later. It's a wonderful way to keep up with the personal tips, mistakes, memories and fun adventures in my garden. It is always a good idea to keep some info on paper, you never know when you computer may die a terrible death. So I am a firm believe in both types of storage, digital and written in a book. I will have to replace my old journal, it is almost filled up. Hi Carol - Thanks for the friendly reminder. I have exactly the same journal (from Lee Valley?) and must admit that it really just collects dust. Will put it on my list of resolutions (along with posting more on my blog, losing weight and weeding more). Actually, this is one of my New Year's resolutions. Thanks for the reminder, Carol, and for the suggestion to make a mistake on the first day--a great way to keep from worrying about perfection. Believe it or not, this year, I started the second of my Lee Valley 10 year Garden Journals! I've found them invaluable for tracking all sorts of things besides gardening--weather, when the birds leave or come back, how long I've owned houseplants--glad to hear about another fan! I've just found your blog and I love that too! I am always somewhat in awe when I hear how faithfully others journal or otherwise keep track of their gardens' goings-on (and regretful that I have done less than well on that count). Not much record-keeping over here, just lots of journals with the first few pages or so filled, then nothing more. I wish you a happy 2011, and a happy second 10-year journal. Impressive! A defined format like your 10-year journals wouldn't work for me, Carol - but I do like my assortment of blank books going back to the 1980's!